The kitchen is the heart of a home, and is most likely the place you spend most of your time at. Its appeal to the eye is therefore important and this can only be achieved through smart organization. Here are some of the best ideas you can implement to not only improve your kitchen’s appeal, but also make it easy to clean, store and retrieve your cooking items. When trying to spice up the look and appeal of your kitchen, sometimes keeping it simple is the best way to go. Planning a complex layout for your kitchen will not only be hectic, but may also end up frustrating you. Things could get clamped and appear congested especially in kitchens with small spaces. Look at this simple yet very admirable and neutral kitchen! Everything looks perfectly organized and as if just in the right place. What we like about this idea is that if you have limited kitchen space, you can easily supplement it with this organization plan.The wall-mounted shelves offer additional storage and display tableware space. The shelves can vary in number depending on the space you have on your wall. Plus, you can have customized shelves such as the one on the left, which is specifically designed to hold your plates vertically. 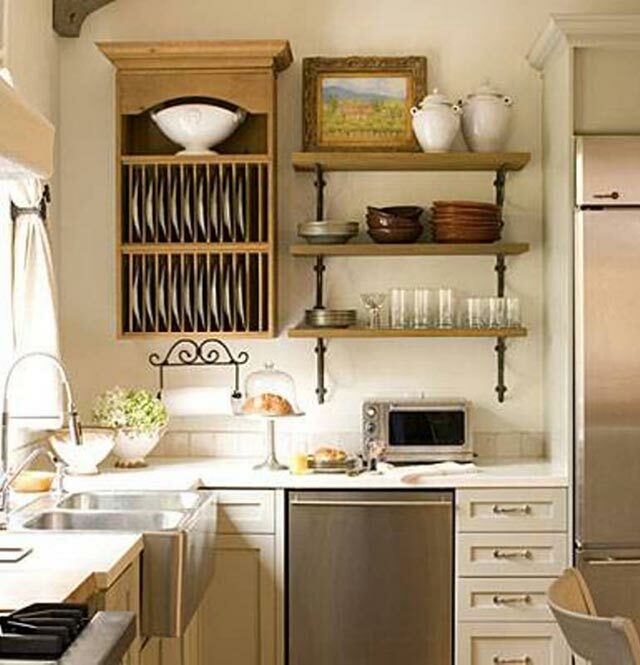 However, we think you can do better by having mounted shelves that blend well with your kitchen décor. Small kitchens always have a great limitation when it comes to space. This can even be worse if you do not have a pantry to help store some foodstuff. However, you need not worry because with this plan, you can be able to maximize on the little space you have. Going vertical is always a smart idea as there is plenty of space when items are organized in a vertical manner with shelves and drawers. This idea is so much like building a skyscraper. You utilize the space upwards because horizontal space is inadequate. What we like about this idea is that with shelves and pull-out drawers, you can easily stack up plenty of food supplies from top to bottom. Plus, all the food items are visible and easily accessible. The items can be arranged in order of frequent use, with those that are frequently used being placed lower than the others. However, we think you can improve on the idea by having some handles on the pull-out drawers. The shelves can also have a simple and easy-to-open door. Have you ever imagined that something uniquely beautiful would come out of that awkward, hard-to-reach, dead corner space of your kitchen? Well, with a smart idea as this one, you can definitely transform that space into a practical kitchen storage for clumsy cookware. In many cases, corner spaces are left un-utilized or designed to just remain as hollow spaces. However, it is time to bring these corners to life with some full-depth pull-out corner drawers. These drawers can be designed to fit and match perfectly with the contours of your kitchen cabinets, just as in the photo shown. 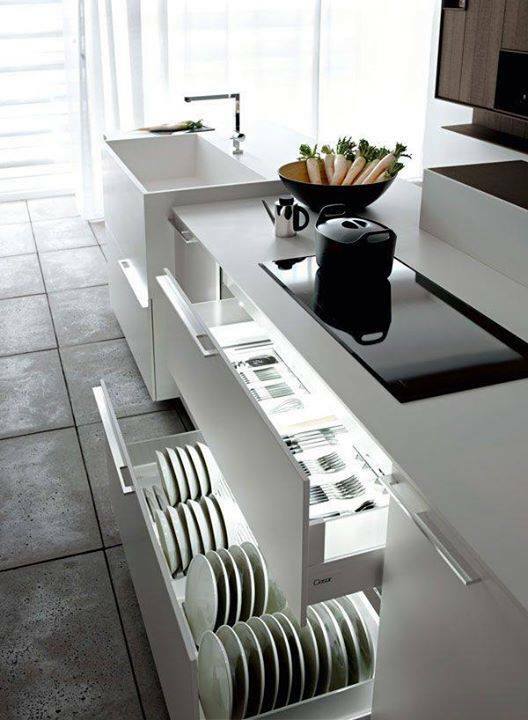 What we like about this idea is that the pull-out drawers look fully integrated with the rest of the kitchen. They also give a touch of modernity and generate very great eye appeal to the space. However, we think you do not have to necessarily implement the exact same design shown, but rather you can think of something quite as unique and beautiful. Having an organized garbage collection point in your kitchen can be quite a challenge especially when it comes to space and location of the unit. Planning on where to store your garbage unit will also greatly depend on its size and design. Look at the design, simplicity and reliability of the garbage unit shown! 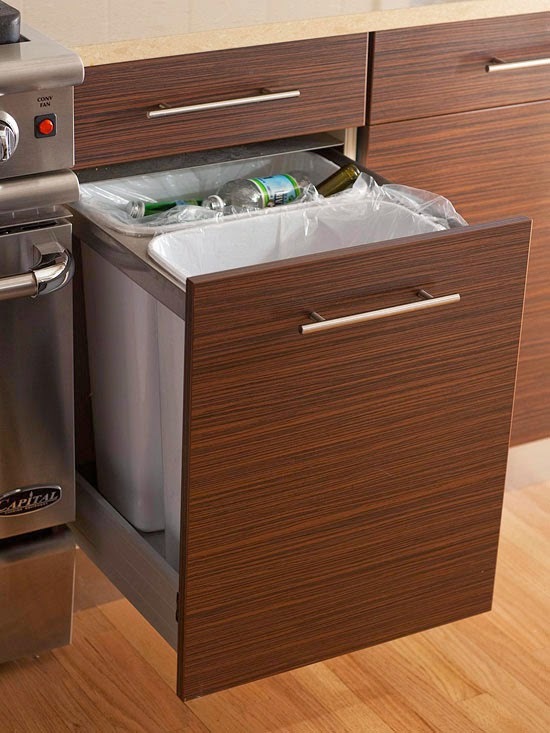 With such a design, it is very easy to have fast access to the garbage unit by just pulling out the drawer. The design creates additional space to even hold two waste baskets at a time. Plus, the unit is closely located to your cooking space, so you can easily dispose off your cooking trash into the pulled-out garbage unit. What we like most about this idea is that once the garbage-unit drawer is drawn-in, you can hardly tell if there is any garbage unit in the kitchen. It becomes concealed behind a beautiful layer of furnishing. 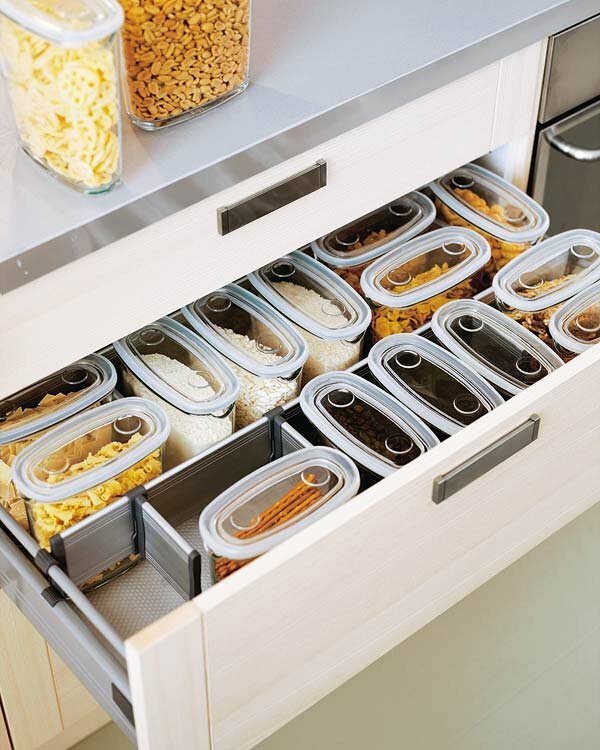 Drawers are critical components in helping you achieve a great kitchen organization plan. They help create additional space and maximize on the use of already existing spaces. However, just having a drawer is not enough. Organizing this drawer and how items are placed in it is what determines the effectiveness of the drawer. For example, using plastic boxes to help organize the space in a drawer, as shown in the photo, can go a long way in improving the appeal of your kitchen. The uniform boxes help you to sub-divide a drawer into sections that can fit your items perfectly. What we love about this idea is that it fully maximizes the space in the drawer, makes it eye appealing, and is also easy to implement. However, we think you can do better by avoiding congestion within the drawers. Kitchen organization trends keep changing and evolving day by day. When planning on how to smartly organize your kitchen, you should strive to ensure that functionality of your plan meets modernity. Try to incorporate designs that not only perform what you want, but also represent up-to-date trends. The kitchen shown strives to deviate from the traditional pull-out drawers that are designed to be layered on top of each, one after the other. 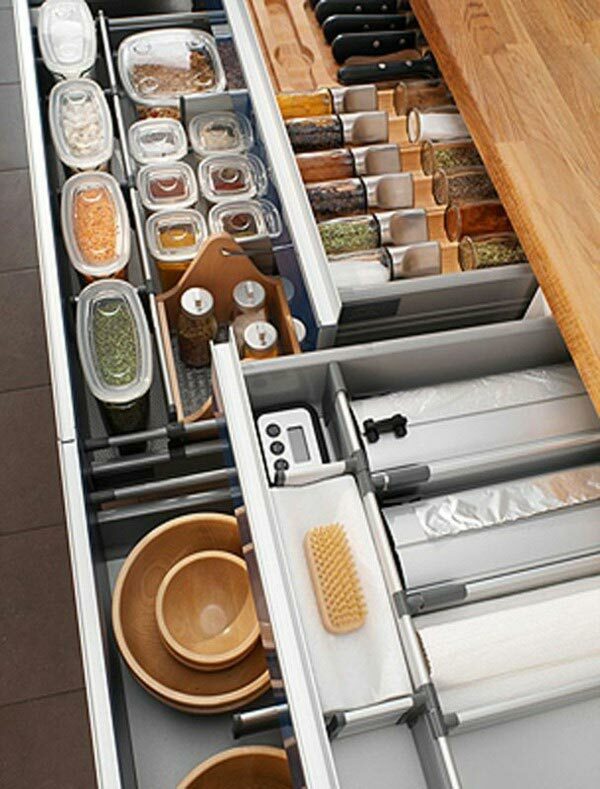 It instead uses one large pull-out drawer, which opens up to reveal another small pull-out drawer. What we love about this idea is the uniqueness and adaptation of kitchen organization to modernity. The drawers are very much functional and also form a unique trend that is stylishly beautiful. If you are thinking of where to find a plan that can work miracles for your kitchen, start by just considering these three aspects; style, modernity and proper organization. With style, you will have to look for something that is quite unique, attractive and perfect for your kitchen’s interior décor. When it comes to modernity, you will have to deviate from traditional designs and look for the latest trends in the market. 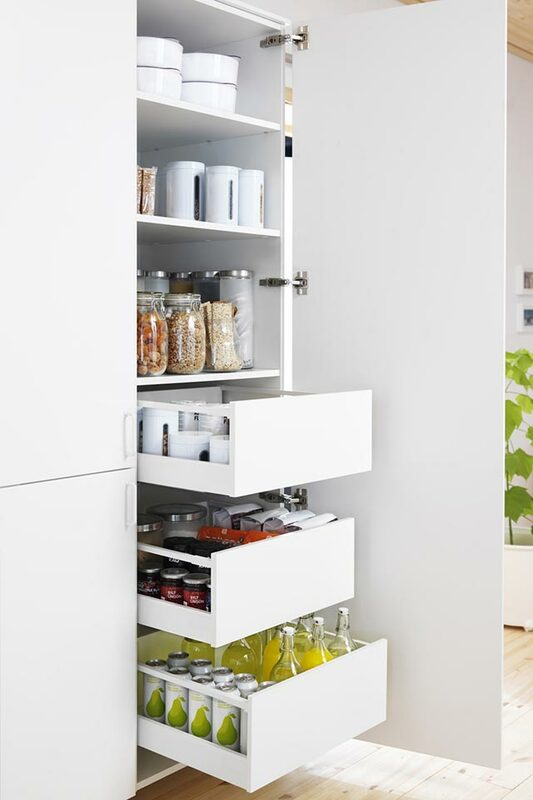 As for organization, this will entirely depend on your effort and design of your kitchen storage units. As shown in the photo, you can organize your kitchen by having the heavier items such as plates on the lower drawers while the lighter items come to the upper drawers. We like this idea because the items can be easily stored and retrieved. There is more to a drawer than just space to throw in foodstuff and equipment. Drawers that will help you maximize your storage space are those that are sub-divided into sections and sub-sections. Just look at the presentation achieved by the use of drawer dividers! 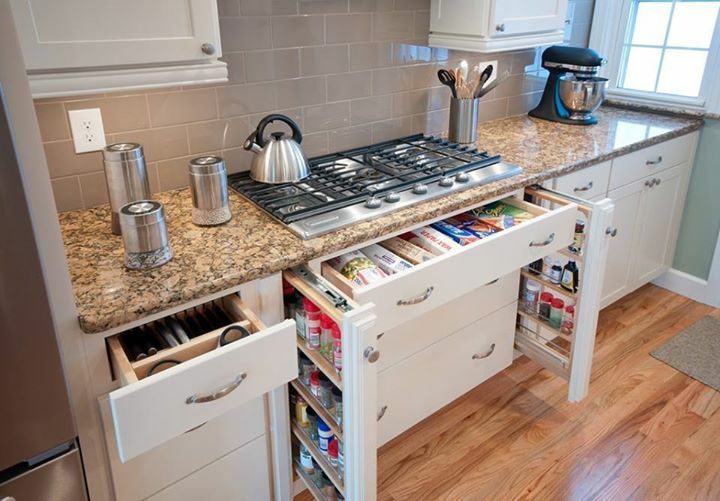 Asides from helping you to effectively plan and organize items in the drawers, it also raises the appeal of the space. You can divide your drawers into an unlimited number of sections, provided they do not get congested or become too small to service their purpose. We love this idea because it serves both purposes of maximizing storage space as well as increasing its appeal. However, you should try as much as possible to avoid congesting the available space in the drawers. Are you often moving from corner to corner of your kitchen looking for spices when cooking? 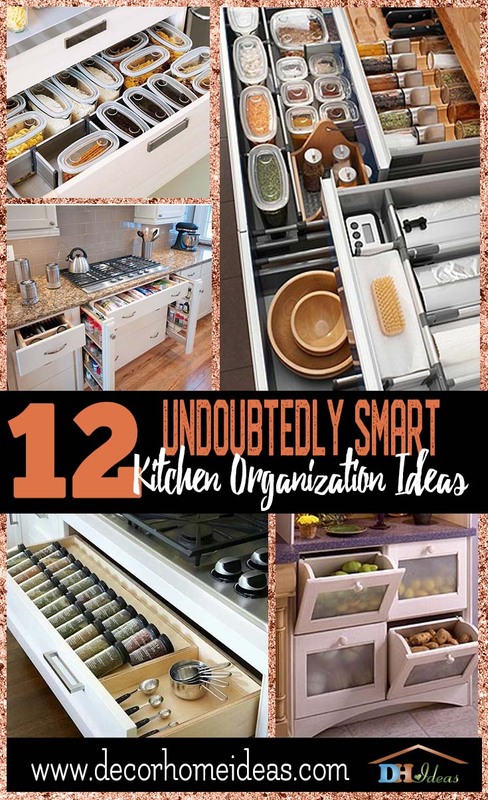 If so, you need a lesson or two on how to organize your kitchen smartly. When cooking, it is paramount that you have all your ingredients close to you at the cooking area. Just look at the simplicity in presentation of the under-stove spice rack shown! 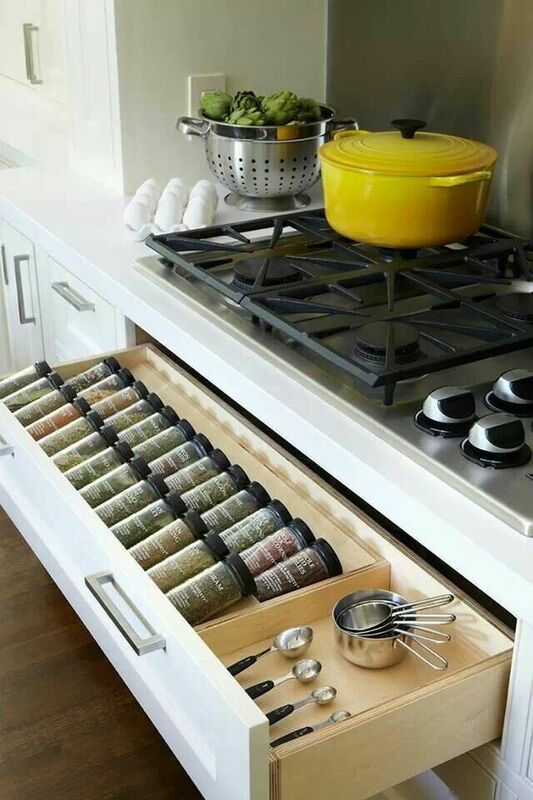 An under-stove spice rack gives you space at the perfect place to store all your spices. When there, you can easily draw the rack and get whatever spice you want at a time. What we love about this idea is that it saves you the trouble of running from corner to corner of the kitchen looking for spices. The rack is just within reach and can pack a good number of cooking spices. However, you can do better by having your rack or pull-out drawer sub-divided into sections to maximize on the storage space. What about a beautiful organization plan that is just fit for the camera? You think it is difficult? Just look at the simple presentation shown here! It is only a matter of placing the right items at the right place and in the right way. Here you only need to think of an organization plan that serves your purpose, but more so delivers on eye appeal and presentability. Think of how the organization plan will look when captured on camera from different angles. We love this idea because of the eye appeal it creates as well as the level of presentability it depicts. However, avoid focusing too much on the appeal rather than the functionality. Some of the best ideas are born from weird trial and error methods. In fact, if human beings never tried on new things, then we would stay stuck with the same old same old stuff and ways of doing things. When organizing your kitchen, it is worth trying new ideas and designs to see how effective they can be in the end. You can see the creativity in the drawer designs developed on the photo. 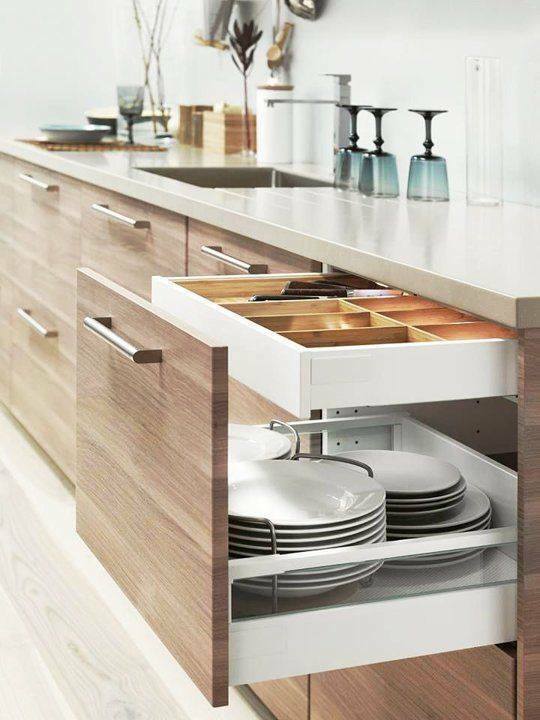 Instead of the typical pull-out drawers, these are uniquely designed to open out from the top, and then stop at an angle for one to easily pull out their foodstuff. What we love most about this idea is its uniqueness, style and utilization of space. One can easily stock and retrieve different types of cooking stuff from the same place and at the same time. 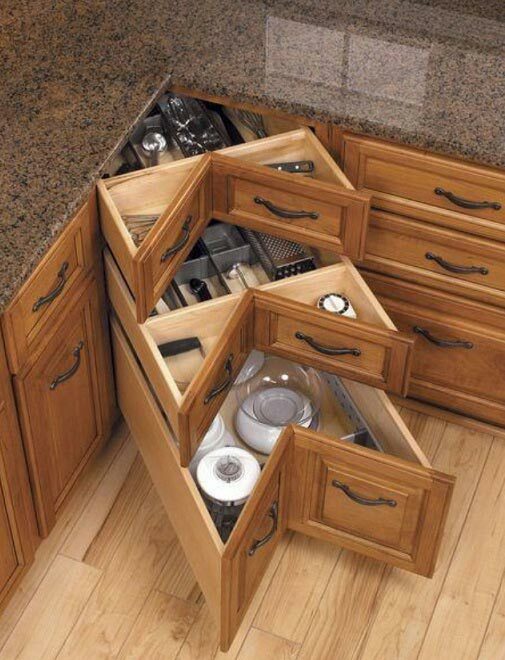 This is where you just put your all in organizing your kitchen. Look at the beauty in the organization of the kitchen shown. Isn’t it just admirable? This idea pretty much brings everything about kitchen organization together under a single roof. 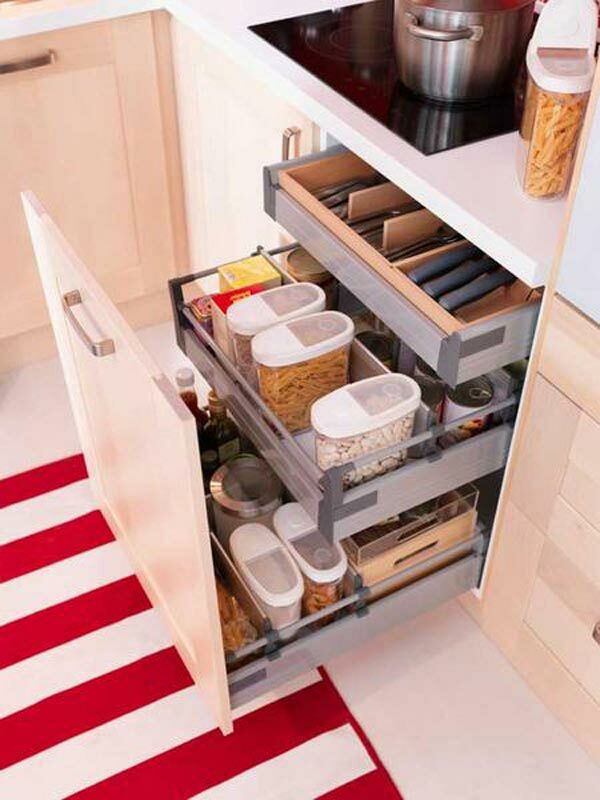 It combines the layout of both horizontal and vertical pull-out drawers. The drawers are well sub-divided to create additional space. 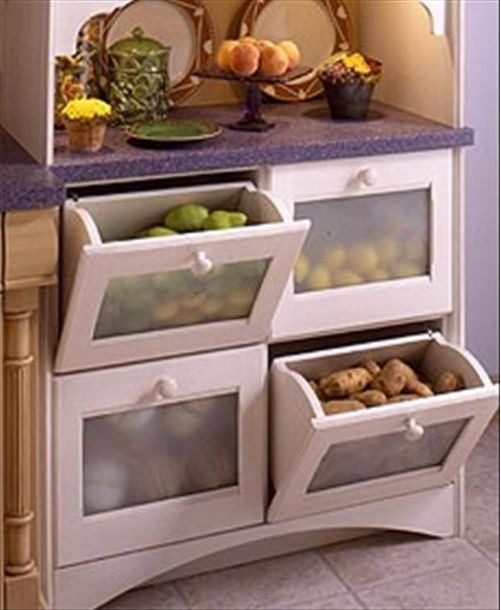 There is also an under-stove drawer that can be used for storing spices. Additionally, the kitchen is just picture-perfect. What we love about this idea is its presentability and functionality. The drawers are well distributed over the space, well sized and well sub-divided into sections on the inside. The organization plan also compliments the interior décor of the kitchen, making it more appealing to the eye. However, we think you would do better if the column drawers were not that much thin.